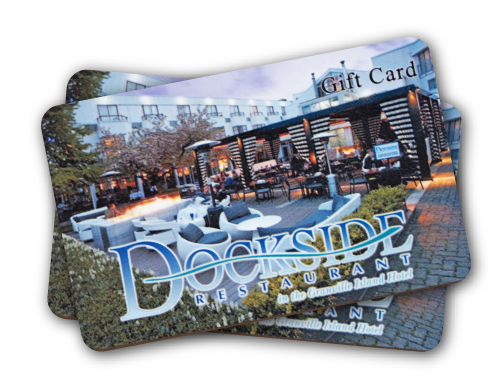 Dockside Restaurant has a wide range of daily a la carte menus with a wide range of breakfast, brunch, lunch, dinner and casual lounge selections. We have extensive experience catering to large parties and events, and a number of year-round and seasonal group and catering menus are available for download. Please contact us directly if you are unsure of the appropriate menu or have any questions related to our food. Our menu of casual classics is built upon a foundation of the freshest local ingredients and OceanWise certified seafood. The dishes are honest and unfussy, yet each one is prepared with expert craft, care and a passionate attention to detail. A daily Fresh Sheet showcases seasonal creations and our culinary inspirations made with the catch of the day. The open kitchen is our centrepiece, wrapped with a 50 foot aquarium and highlighted with the flames from our large forno oven; fired up to 500 degrees and turning out prime rib, roasted chicken and some of the best thin crust pizzas in town. To accompany our menu, the Dockside Restaurant makes eight signature beers in one of Vancouver’s only in-house breweries. A sampler six-pack of 6oz glasses will help you find a favourite to perfectly compliment your meal or to enjoy all on its own while relaxing in our lounge, restaurant bar or on our patio. Whether it’s a Pelican Bay Brown Ale or the popular, hibiscus-infused Jamaican Lager our Brewmaster, Peter Haupenthal crafts something that will be perfect for your taste. Wine lovers aso get spoiled at Dockside with a 150-bottle selection that spans selections from BC’s world-class wine growing regions and superb reds, whites and bubbles from around the World. You can always taste the difference freshness makes, and when it comes to beer you can’t get it fresher than the selections crafted by our in-house Brewmaster Peter Haupenthal. Ask your server for a recommendation to pair with your meal or to enjoy all on its own.